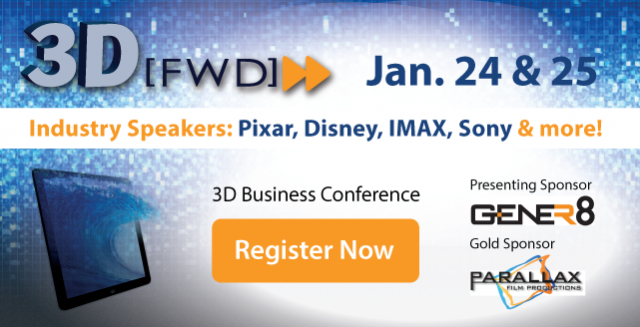 Vancouver, CAN January 16, 2013 | Emily Carr’s S3D Centre and The International 3D Society will host 3D[FWD], a conference focused on the business of 3D, on January 24th and 25th at the Vancity Theatre. The conference brings together leaders from a cross-section of industries, such as healthcare, advertising, entertainment, and digital media to explore the impact of 3D technology in today’s marketplace and for the future. Leaders and innovators in 3D from Hollywood, London, and Canada (including Academy Award winners), will showcase, discuss, and debate some of the latest developments in 3D and explore how the 3D transformation will affect business. With more than 50 major 3D movies scheduled for release in 2013, millions of 3DTV sets being sold in the global marketplace, and an abundance of stereoscopic consumer products to be launched, it is an opportune time to learn how 3D can be used as a powerful business tool. Topics to be covered include Storytelling in 3D, Canada’s Evolving 3D Landscape, Finance and Content Licensing, Post Production, 3D Conversion, and Advertising and Marketing in the 3D Space. Buzz Hays, Founder, True Image Co. Inc.
James Stewart, Director/Producer, Geneva Film Co.
For the latest updates, more information and ticket purchase go to www.3Dsociety.ca. 3D[FWD] conference also signifies the launch of the first Canadian Chapter of the International 3D Society. The International 3D Society merged with the 3D@Home Consortium in August to create the world’s foremost organization of companies and individuals committed to the success of 3D storytelling, technical achievement, and consumer adoption. Member companies include: The Walt Disney Studios Motion Pictures, DreamWorks Animation (DWA), Sony Pictures Entertainment, Samsung, IMAX, ESPN 3D, 3net, CCTV China, bSkyb UK, 3D Consortium France, Korea Telecomm, Panasonic, Sony Electronics, Sony Playstation, StereoD, Intel, Microsoft, Vizio, 3ality Technica, RealD, Masterimage 3D, XPAND, and Dolby, among others. The International 3D Society & 3D@Home Consortium advances 3D content, products and adoption through recognition, networking, and communication for professionals and consumers. With over 60 companies and 500 professional members, the organization honors the year’s best during its 3D Technology and 3D Creative Awards programs; hosts worldwide meetings, workshops and demonstrations; and manages many online resources to assist consumers and professionals to further understand and integrate 3D into their lives. Visit: www.International3DSociety.com, www.3DatHome.org, and 3DUniversity.net to explore the full range of 3D information available. The S3D Centre at Emily Carr University of Art + Design’s mission is to advance the art of Stereoscopic 3D. Our applied research programs and training activities focus on the creative applications made possible by experimenting with S3D production technologies and processes. With the support of our partners and students, our aim is to teach, train and discover the aesthetic and creative possibilities of Stereoscopic 3D. Find out more at s3dcentre.ca and ecuad.ca.